Quique Sanchez Flores' final game as Watford manager was an entertaining draw with Sunderland at Vicarage Road. Having secured their Premier League safety on Wednesday, Sunderland made nine changes and led when Jack Rodwell turned in Jeremain Lens' low cross. Sebastian Prodl's header levelled for Watford just after the break before Lens drove in three minutes later. Troy Deeney's penalty equalised again but the away side, who had two goals disallowed, held on for a point. It was decided Flores would be leaving following talks with Watford's owners this week and he was given a warm send-off as he waved to fans after the final whistle. The Spaniard has taken the club to 13th and Premier League safety since his appointment at the end of last season's promotion-winning campaign, not to mention a Wembley appearance in the FA Cup semi-finals. But in a sign they are setting their sights on achieving far more, the Pozzo family are now looking for their seventh full-time manager since taking over in June 2012. The Hornets could certainly have taken more from Sunday's game. Deeney converted from the spot after a foul by John O'Shea on Jose Jurado and momentum began to build once they drew level a second time. Odion Ighalo was the prime culprit in missing a brilliant chance from close range with two minutes to play but in truth a Watford victory, despite their late surge, would have been harsh on Sunderland. With a place in next season's Premier League secured at the expense of local rivals Newcastle, the Black Cats' travelling fans were in fine voice all afternoon. Manager Sam Allardyce was seemingly in a relaxed mood too, handing senior debuts to three academy graduates in Rees Greenwood, Thomas Robson and George Honeyman, who came on in the second half. The nine changes in Sunderland's side made for an unconvincing first half hour but as an overall performance this will provide Allardyce with plenty of food for thought in the off-season. The fringe players and youngsters on show should perhaps have seen their lead doubled just before the break, when Duncan Watmore's low finish was ruled out for offside despite replays showing he was level. But a point apiece was a fair result as Sunderland ensured they ended the campaign with one defeat in their final 11 games. Watford manager Quique Sanchez Flores: "My job is absolutely complete. The only target we had is to keep the team in the division and the way we did this was amazing. "We didn't suffer, we enjoyed it. We didn't suffer against the big teams. Always I feel we are in the right way. For me, 45 points is a lot for a team just promoted. "The first year is the most difficult year because to build the squad during pre-season was difficult. Watford now is established in a good position so I think the normal thing for Watford next year is trying to improve the performance in the Premier League." Sunderland manager Sam Allardyce: "If we had needed three points and only got one, we would be in serious trouble with the officials not giving us the onside goals. Thankfully those major decisions which we have no control over did not affect our status. "The confidence will go into next season. All the players can come back with a spring in their step. We averaged two points per game over the last six games, that is top six stuff in the league. "To think we had 12 points in six games, and only finished fourth from bottom, is a pretty miraculous total. Like next season, let's get 12 points in the first six games, not the last." Match ends, Watford 2, Sunderland 2. 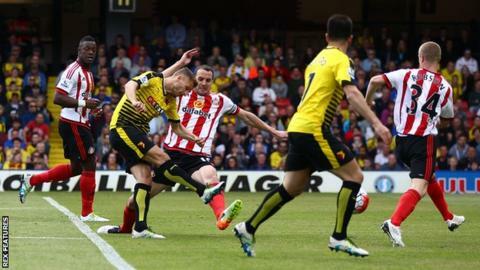 Second Half ends, Watford 2, Sunderland 2. Attempt missed. Adlène Guédioura (Watford) right footed shot from the right side of the box is high and wide to the right. Assisted by Ben Watson. Corner, Watford. Conceded by Lamine Koné. Attempt missed. Juan Carlos Paredes (Watford) right footed shot from outside the box misses to the left following a corner. Attempt blocked. Odion Ighalo (Watford) right footed shot from the centre of the box is blocked. Assisted by Mario Suárez. Attempt saved. Duncan Watmore (Sunderland) left footed shot from the left side of the box is saved in the centre of the goal. Assisted by George Honeyman. Foul by Mario Suárez (Watford). Dame N'Doye (Sunderland) wins a free kick on the right wing. Attempt missed. Mario Suárez (Watford) right footed shot from outside the box is high and wide to the left. Substitution, Watford. Nordin Amrabat replaces Jurado. Adlène Guédioura (Watford) is shown the yellow card for a bad foul. Substitution, Sunderland. Billy Jones replaces DeAndre Yedlin because of an injury. Delay in match DeAndre Yedlin (Sunderland) because of an injury. Thomas Robson (Sunderland) wins a free kick on the left wing. Jordan Pickford (Sunderland) wins a free kick in the defensive half. Miguel Britos (Watford) wins a free kick on the left wing. Substitution, Watford. Mario Suárez replaces Almen Abdi. Jurado (Watford) wins a free kick in the attacking half. Foul by Yann M'Vila (Sunderland). Offside, Sunderland. Duncan Watmore tries a through ball, but Dame N'Doye is caught offside.